today my QuiltCon challenge block is one of many being featured over at the Modern Quilt Guild! mine fell in the category of traditional motifs. be sure to check out the previous posts too, there are some amazing blocks! 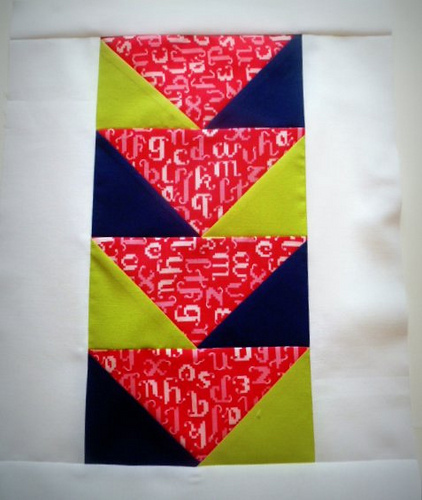 i can't begin to imagine the quilt she's going to make with all the cool blocks she has to choose from! if you don't know what i'm talking about, there's a great description at their website. 20 blocks will be chosen to go into a raffle quilt, and the remaining will be made into quilts for 46 beds at the austin children's shelter. won't that be so great?! i thought i'd share with you the easy instructions for making this block. i used this method for making the flying geese, and i really like it. simple, easy, and fast. so, start with one 7.5" square and four 4" squares . i used two colors for my 4 inch squares. lay two of the same color blocks out in opposite corners. draw a line, corner to corner. stitch on both sides of the line. cut in half along drawn line, and press. now you have 2 little heart shapes! lay another 4 inch square in the remaining corners. same thing - draw a line, stitch along both sides, cut, press. tada! four flying geese! trim them up, stitch them together, and add some white to both sides. 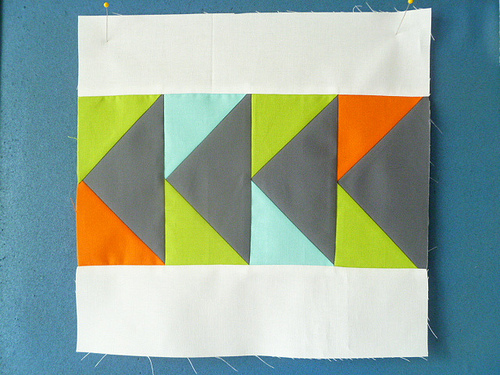 for this block i used 2 1/2" strips, but you can make this block whatever size you want by changing those widths. 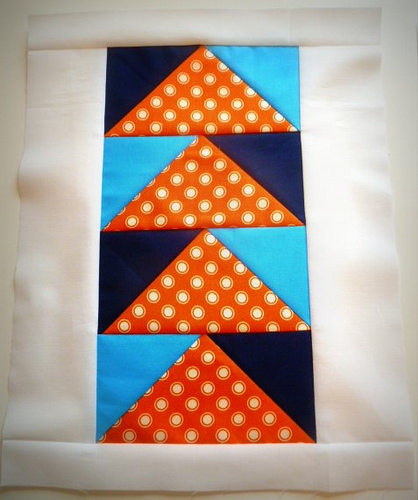 you can also add another strip to the top and bottom, like in the blocks i made for do. good stitches. i keep imagining this repeated in a quilt, but i can't decide which colors i'd like the best! or which direction i'd have them go. what would you do?! if you make this, i'd love to see it! drop me an email or add it to my flickr pool! That is a cool tutorial for flying geese that I have not seen before!! Thanks for sharing Tammie! That is a brilliant way of doing flying geese. I will share it with my quilting group. Great tutorial for this metod. I've bookmarked it in order to easily share it in the future, thank you! With the 7.5" and 4" starting squares, what is measurements of the resulting Flying Geese? Finished or unfinished? Any tips for figuring out what sizes to start with to get a specific size at the end? Like a formula or some such?